The use of Tasers® by the police is subject to intense scrutiny and controversy. With increasing numbers of police officers carrying Tasers, it is important that nurses in pre-hospital, emergency department and police custody settings understand how Tasers work, and the physiological effects. 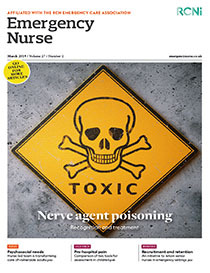 This article describes Tasers, their mechanisms and physiological effects, and explains how nurses should undertake assessment of people who have been subjected to Taser discharge.